receive a complimentary intensive Propolis Lotion. Actions: The powerful ingredient of Propolis for purifying, antiseptic, healing and decongesting. Effectively treats hyperseborrheic, acne-prone skin. Indications: For oily and acne-prone skins in need. Results: Skin is purified and healed. Skin is effectively treated. A wonderful relief for those skins in need. Long lasting and continuous results. Instructions for use: Apply to clean, dry skin on the face and neck morning and evening. 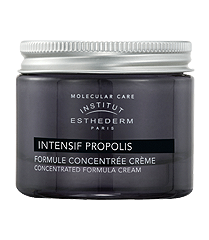 For a more intensive treatment apply after Intensif Propolis Serum. Effective!